Phillips Murrah attorneys and summer clerks visit nursing home - Phillips Murrah P.C. From left: Marchi McCartney, Kendra Norman, Nancy Parrot, William Sobral, Hilary Hudson, Judge Patricia Parrish, Ray Zschiesche, Monica Ybarra, Travis Weedn and Chance Pearson. 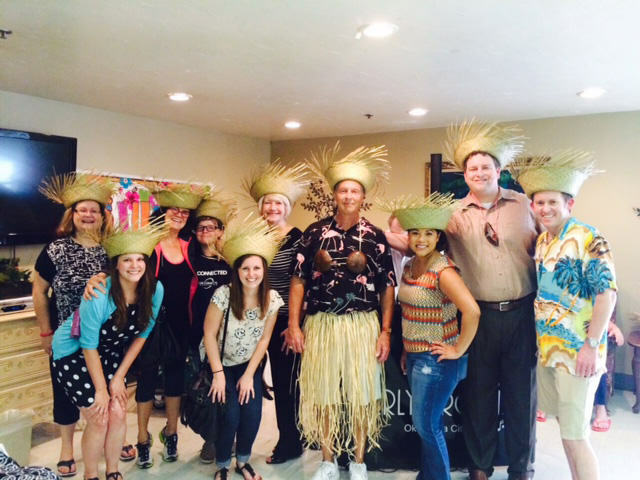 Friday afternoon, Aug 7, the Oklahoma County Bar Association Community Service Committee had a Luau-themed party for the residents of the Edwards Redeemer Nursing Home. Phillips Murrah attorneys Director Ray Zschiesche and Monica Ybarra were on hand to dance and visit with the Edwards Redeemer Nursing Home residents, along with our summer clerks, Hillary Hudson, Kendra Norman, Jace White and Ben McCaslin.